Finally, it's here! 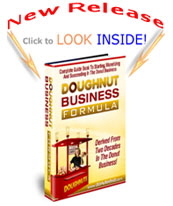 The Doughnut Business Formula (hardbound book). This 242-page book is a step-by-step guide to starting your own profitable business selling donuts! 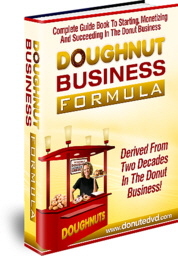 Please enjoy the above video presentation of the book and The Doughnut Business Formula, table of chapters, listed below. This comprehensive chapter tells you about all the ingredients needed to make doughnuts from Scratch. We begin by listing the ingredients needed for yeast and cake doughnut recipes. Learn how to cook with flours, sugars and oils. We then explain the method to successfully make pour batters and soft doughs for superior yeast and cake doughnut. We finish with a chapter on modifying existing recipes to make your very own kind of doughnuts. This preparatory chapter will help you utilize chapter 2 (Advanced Yeast & Cake� Doughnut Making Techniques.). Utilizing my twenty-years of doughnut making experience, we continue our journey with advanced yeast doughnut making methods (recipe included). The advanced doughnut making course on DVDS clarifies and complements this specific chapter. We explain in an easy to understand step-by-step process about everything you need to know to make yeast and follow cake doughnut recipes from scratch. We also offer personal tips, donut calculation formulas and recipes passed down to me by some old-time bakers. Also included are resources to acquire ingredients and donut equipment with common prices and excellent donut icing, topping and filling recipes. Everything you need to operate your own donut shop is covered, including store layout, automated donut makers, recipes, premixes, and baking and frying methods. A compilation of donut making tips, advice and business Insights we handpicked from 2000+ ideas from our twenty years of experience in the industry. The book starts with an in-depth analysis of the doughnut business derived from the twenty years of business experience and complemented with four months of research. 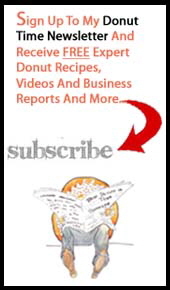 You will learn about the doughnut industry, interoperations, the doughnut shop owner mindset, the doughnut maker, the counter person and the doughnut connoisseur. The book explains how to successfully acquire daily contractual doughnut wholesale accounts and avoid costly mistakes. In addition, it tells about the specific equipment you need based on your own particular requirements and what kind of doughnut business you hope to have. Yes, that's right! Learn the secrets of booking hugely profitable events, including state fairs, festivals, concerts and carnivals. The book explains what you need to know before you approach event managers. It is all based on the seven critical factors a signature food item must meet. Then I generously share a specialty doughnut line, based on the seven critical factors a signature food item must meet. A doughnut line made in multiple varieties to almost guarantee successful booking of events. The book offers the best doughnut business advice money can buy. No other book provides such valuable advice. The Doughnut Business Formula describes an ideal location for your new business, along with places to avoid. But that's not all. The book also provides detailed information about identifying and understanding how to rent or purchase a business location. It informs you about determining a community's wants and needs. And about identifying and fulfilling a particular doughnut niche. Products that go together, sell well together. The chapter on marketing is very useful. In easy to understand language it explains how to up-sell and cross-sell related products that sell well together with doughnuts. New businesses require advanced advertising, marketing, branding and promotion. You will be SHOCKED when you discover our method of attracting free media publicity for your business grand opening. The media will be attracted to your grand opening like moths to a fire. We inform you of proven methods of acquiring many kinds of free bakery equipment, including display cases, espresso machines and coffee brewers. But it doesn't stop there! You will be armed with our insights to capturing discounts from local ingredient suppliers and negotiating lower prices on bulk orders. When you place a order for my donut training DVD/books. You will receive your Book delivered to your door step in 5-7 business days + instant access. The Doughnut Business Formula (bounded bound book). This 242-page book is a step-by-step guide to starting your own profitable business selling donuts!